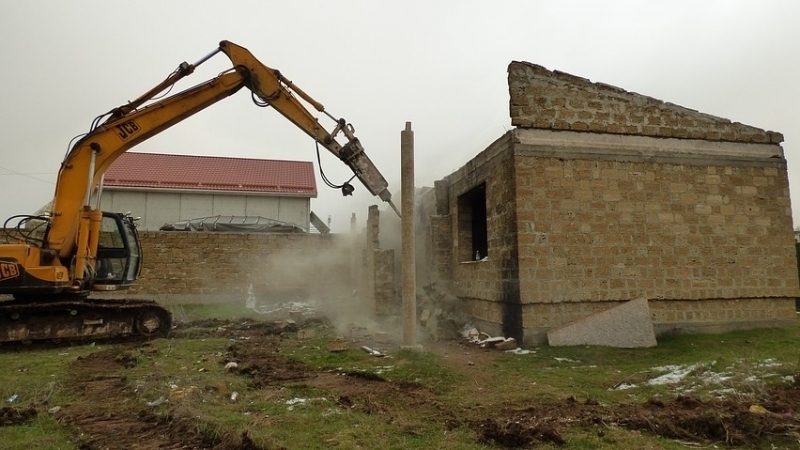 In the occupied Crimea, representatives of the company "Akura" with the help of special equipment demolished the unfinished mosque Ar-Rahman, which was being built on the money of the local community, Crimean Human Rights Group reported on Facebook on June 4. According to lawyer Mammet Mambetov, businessmen did not provide the community of the "Strelkovaya" neighborhood with any court decision to demolish the building. In this area, where private houses are located, the company "Akura" is going to erect new buildings, where, according to the plan, 9 thousand people will live. Crimean human rights defenders note that activist Fazil Ibraimov, who opposes the construction in the neighborhood implying eviction of local residents, was detained on February 15, 2018 in Simferopol. The invaders opened two criminal cases against him and keep the activist in the Simferopol jail. Earlier, the Crimean Tatars from the "Strelkovaya" residential district announced an indefinite hunger strike, demanding a meeting with Russian President Vladimir Putin. Activists intend to starve until the head of the Kremlin meets with them. According to them, local collaboration authorities are not going to solve their housing problems. Activists state that the invaders seek to demolish a residential district of "Strelkovaya", which appeared as a result of land squatting. In this territory, one of the companies of the group "Monolit" plans to build a new residential complex "Crimean Rose".